The Portland Trail Blazers enjoy a passionate following among NBA fans, whether in the stands of their home court at Moda Center, or listening to live radio streams over the air or online. Recently, the franchise turned to LineQ, the chief distributor of Barix products in the United States, to improve the fan experience. The solution employs three Barix Instreamer IP audio devices to encode live game feeds into files for streaming over the internet and to mobile devices. The streams additionally incorporate live closed-captioning for hearing-impaired fans. Because they own rights to their broadcasts, the Trail Blazers can create an entire program at Moda Center for distribution to their network of 30 radio affiliates throughout Oregon. The program not only includes broadcasts of all the games—both home and road—but also all commercial content, announcements, and pre- and post-game shows. The Instreamers replaced the traditional legacy gear to encode and deliver the program stream, as well as the dial-up phone service the team had been using for captioning. Using the Barix architecture, the radio broadcast signals are encoded in the arena and distributed in several ways. 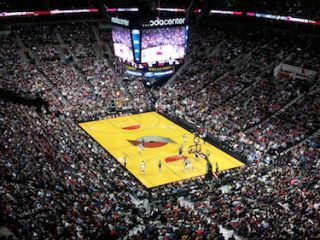 The system delivers the game audio to mobile devices inside the arena over a WiFi network, and to fans via the Trail Blazers mobile app within 75 miles of the venue. The Blazers recently redesigned their mobile app, accessible via smartphones and tablets, and added free Wi-Fi connectivity to the internet within their 20,000-seat arena to enhance the in-game experience. LineQ’s solution also played a vital role in the mobile app scenario, with the Barix feeds giving fans access to a live radio stream of the audio within 75 miles of the Moda Center. Janes says he appreciates how Instreamer can flexibly deliver good program quality at a lower bitrate. Janes adds that since moving to Barix, the franchise has since delivered better quality performance and service to its audience. The architecture has also made life easier for the caption operator, who previously had to dial into a phone line, and wait for the engineering department to connect the line to the audio so he or she could hear and transcribe the content.